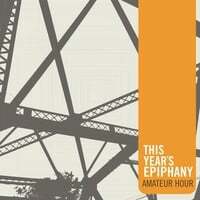 Amateur Hour-This Year's Epiphany. Missed this one when it came out last summer, but had I heard it then it would have likely grabbed a place on the top 75 list. While hailing from the DC area, Amateur Hour have a trad-rock sound that comes to the fore on the great "Goodbye Memphis", frontman Dan Perriello's tribute to Alex Chilton. Unsurprisingly there's some Big Star influence here, albeit more as filtered through The Replacements, and some other standouts include the insistent title track and the gritty midtempo rock of "Any Other Day". The album was recorded in 3 days with minimal overdubs, and it has an immediate feel that so many other albums lack. Fans of the aforementioned bands as well as The Riffbrokers, Pale Hollow and High on Stress will definitely want to give this one a spin. HiFi Superstar-One Hit Wonder. I did hear this one in 2011 and it placed in the year-end list, but I never formally reviewed it. In case the band name doesn't ring a bell, that's because these guys used to be known as BrownLine Fiasco until 2009. A definite improvement on the name and also a definite improvement on the new album, which finds them refining their vintage power pop sound. With a sound that bridges modern-day power pop purveyors like Weezer and Rooney with classic bands like Cheap Trick there's something here for everyone. The driving opener "Closer" gives you a good idea of what to expect, while "Give Me a Try" delves into the meta-rock that Meyerman pulled off on their great album last year with its depiction of an aging rocker trying to stay relevant. "Love is Enough" finds them maintaining the melody while slowing things down, and "Knock on Wood" will turn your frown upside down with its buoyantly cheery melody and arrangement. A strong effort under any name.